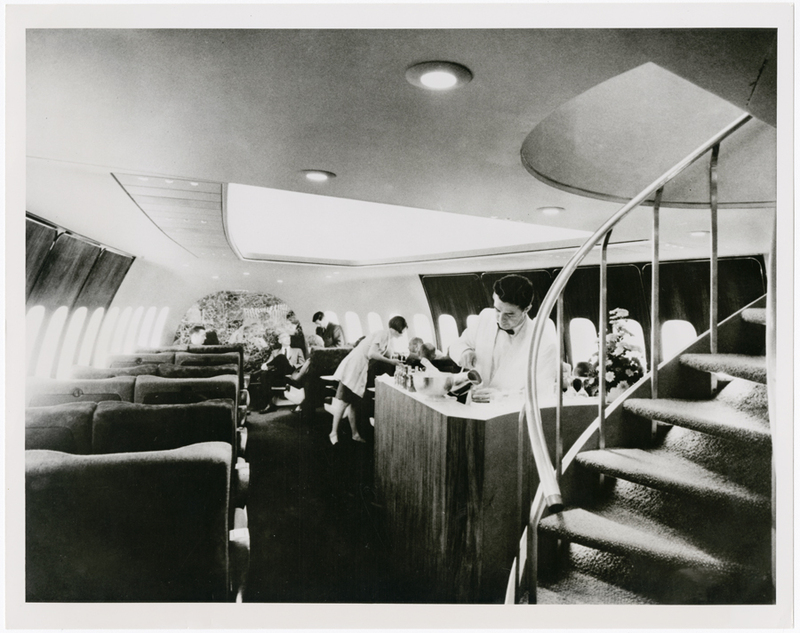 Pan Am caption: "SPACIOUS FIRST CLASS SECTION Pan Am's 747 Superjet Clipper features seats 10 per cent wider than those in today's Boeing 707 and Douglas DC8 jet transports. A dozen individual seats mounted on swivels in the First Class cabin will allow passengers to sit at convenient tables or chat with fellow passengers without straining their necks. Two-abreast seating is standard in the First Class section. A spiral staircase just behind the bar leads to the second deck staterooms." 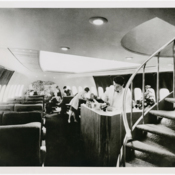 “Pan American World Airways Boeing 747, interior image of spiral staircase and bar,” UM Libraries Digital Exhibits, accessed April 22, 2019, http://scholar.library.miami.edu/digital/items/show/655.